ChainspikeMedia:S&K MD US SonicJam manual.pdf, called Crow (クロウ) in the Japanese manualMedia:S&K MD JP SonicJam manual.pdf, is a Badnik from Sonic & Knuckles found in Death Egg Zone. 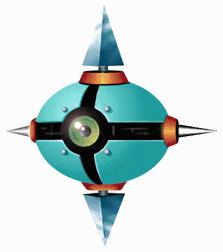 They hover in place, dropping the lower spike down towards the player underneath it, then rapidly move to above the spot the player is currently standing at. They are very difficult to destroy without taking damage, unless the character is in a Super or Hyper form. This page was last edited on 29 September 2018, at 13:13.